Short biographies of the friends who have contributed to this site. Apes are primates that resemble humans, with long arms, broad chests, and no tails. The Great Apes are the chimpanzees, gorillas, bonobos and orangutans; the Lesser Apes are the gibbons, including the siamang. All apes are endangered; their intelligence is well-documented, as attested to by Washoe the chimpanzee and Koko the gorilla. To learn more about apes, visit EnchantedLearning.com. The only eagle unique to North America, and the U.S. national bird, the bald eagle is found from Alaska down to Northern Mexico, with the greatest numbers living in Alaska, Canada and the Pacific Northwest. They flourish there partly because of the ready availability of salmon; dead and dying fish constitute a major portion of their diet. Bald eagles (called “bald” because that term used to mean “white”) have wingspans from 72-90 inches, can fly at altitudes up to 10,000 feet, and attain speeds of up to 35 miles per hour. They mate for life. The bald eagle was officially removed from the Endangered Species list on June 28, 2007, but is still protected under the Migratory Bird Treaty Act and the Bald and Golden Eagle Protection Act. To learn more about bald eagles, visit http://www.baldeagleinfo.com. Found throughout most of North America, beavers are one of nature’s best friends. Their dam-building activities create wetlands, providing multiple benefits for the environment. The dams help to slow the flow of flood water, prevent erosion, increase the water table, and assist, through the process of filtration provided by the wetland, in purifying the water. Wetlands provide homes for a variety of land, water, and bird species, many of which are endangered. Beavers are gentle creatures, who learn through imitation and experience. They even play practical jokes! Their large tails, which they slap on the water to signal danger and warn off predators, help them maintain their balance while gnawing on trees. For more information about beavers, visit http://www.beaversww.org/beaver.html and http://www.nhptv.org/natureworks/beaver.htm. Boomer belongs to a little girl who cuddles him upside down in her arms. He lives in Rectortown, Virginia, and was adopted from the Middleburg Humane Foundation in Marshall, Virginia. He spent a couple of weeks with Sananjaleen/June Hughes while his family was away, and amazed her with his gentleness and delightful curiosity to explore all and jump up on everything. He triggered childhood remembrances in all who met him. Broad-tailed hummingbirds spend their summers throughout the western United States, and their winters in Mexico. Males have an iridescent green back with a red patch under the neck, and a light-colored underside; females are also green, with a white neck flecked with green or beige, and a light-colored underside. Their diet consists primarily of nectar, small insects, and some sap; their bodies are especially adapted to cool mountain nights, during which time they can slow down their heart-rate and reduce their body temperature in order to slow down their metabolism ("torpor"). They are often found in high elevations (up to 10,000 feet), in woodlands and mountain meadows. (Information from sdakotabirds.com, enature.com and Cornell Lab of Ornithology). Known for their “flying v” formation and boisterous honking, Canada Geese are found throughout much of North America. They migrate as far south as northern Mexico in winter, returning north again in spring. They often gather in open areas such as lawns, parks and golf courses, where they can easily watch for predators. Some flocks no longer migrate, choosing instead to remain in a preferred area. As a result, Canada Geese are now considered a “nuisance” in some places. Geese mate for life and are highly communicative, with baby geese communicating with their parents from inside the egg! Families are often seen swimming together, with the mother in front, the babies behind, and the father bringing up the rear. Learn more about geese at http://www.ducks.ca/resource/general/wetland/geese.html and Cornell Lab of Ornithology. Canterbury's Little Candace - miniature long-haired dachshund of champion quality, but too shy to show, Candace had several puppies and came to Sananjaleen/June Hughes at five years old. So sweet and loving, she dearly loves her many human and animal friends and is of major importance during their meditation and Quantum Touch healing workshops, often asking to be lifted up onto the table with the "client." Chaka was a black Lab rescued from the streets of Puerto Rico. He came to Jo Anne Rando-Moon through the Best Friends Animal Sanctuary, and was with her for the 6 1/2 years she has been living in Kanab, accompanying her to work and on mini-vacations. He passed away in June 2005. Chipper made his transition over the Rainbow Bridge in May 2003. He was the much beloved golden retriever companion of Delphi, Light and Patricia Jepsen. Chipper was an example of love in action, making friends with everyone he met. Christian the lion was bought as a cub from Harrod's department store in London in 1969. After a year, the two men who had bought him realized they could no longer properly care for him -- he was by now almost 200 pounds. Through an encounter with two of the actors from Born Free, they made a connection with George Adamson, a conservationist in Kenya who had raised lion cubs and reintroduced them into the wild. Christian was soon on his way to Kenya, where he adapted to his new surroundings -- but still remembered his human friends. Read more about Christan here. There is also a book about his life: A Lion Called Christian, and a documentary, Christian: The Lion at World's End, profiling his release into the wild. Copper, or "Spirit Dog," a husky/golden retriever mix, joined Patricia Jepsen in Summer 2003. He arrived from Best Friends Animal Sanctuary in Kanab, Utah, where he had recovered from a serious illness. Having formerly lived on the Navajo reservation, he has a keen awareness of the indigenous way of life and connection to the land. He is the author of the booklet Listen to the Land with Patricia Jepsen. Copper made his transition over the Rainbow Bridge in June 2008. In Patricia Jepsen's words: "Delphi is my golden retriever partner, an ex-show dog who knew her purpose and took me with her along the journey of love and selfless service. She is an angel. In another dimension Delphi’s real name is the Awakening Angel. "Delphi is the author of Six Lessons with Delphi: How to Live Happily wth All Life and she co-authored with me Delphi: What Being on Earth is All About. Delphi has been the inspiration for The Sanctuary School, an on-line heart-based educational program. She encouraged me to open my heart to my ability to communicate with all life, and she urged me to join her in teaching others animal communication and the Circle of Life consciousness. Delphi has appeared to others in their meditations, giving guidance and love. She has shared her teachings in prisons, juvenile detention facilities, schools and international projects such as the MPH Group in Israel (see You and Me at www.mph-group.com) and works closely with www.projectrestore.us. She was also the inspiration behind the Delphi Kids Club, an earth partnership club for children and their families in Tucson, Arizona (2002-07). "Delphi says that our hope is with the children. What matters to her is that every child remembers that they can make a difference. They are special!" For more information about Delphi and her books, visit www.patriciajepsen.com. *Addendum: in Spring 2007, Delphi crossed over the Rainbow Bridge after a long life of service. She now oversees the Rainbow Temple for children. Elfie shared a home with his friends Ann and Steve and his canine friend Jamie (a golden retriever/yellow lab mix). 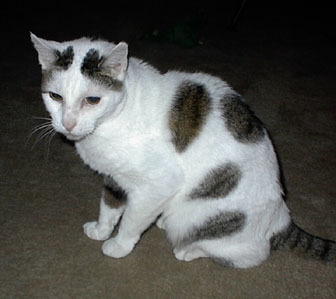 A wise and loving cat, he made his transition over the Rainbow Bridge in August 2007. We will be forever grateful for his contribution to this website. The foal is the daughter of a gray mare who lives next door to Sananjaleen/June Hughes in Rectortown, Virginia. They board with Sananjaleen's neighbor, a veterinarian. Two more foals were also born around the same time, so she will have lots of company! Freedom, the American Bald Eagle, is a true survivor and amazing ambassador for her species. Bald eagles live throughout the United States, Canada, and northern Mexico, with greatest concentrations in the Northwestern US, Canada and Alaska. They are called “bald” because that word at one time meant “white.” They are the national bird and symbol of the United States of America. Bald Eagles were listed as endangered from 1967 to 1995, with an all-time low of less than 500 breeding pairs left in North America prior to that time. As their numbers rose, they were delisted from “endangered” to “threatened” in 1995, and then removed from the Endangered Species List altogether on June 28, 2007. They are still protected by the Migratory Bird Treaty Act and the Bald Eagle Protection Act. For more information about bald eagles, visit the American Bald Eagle Foundation or the American Bald Eagle Information website. Two wild swans on the German island of Ruegen, in the Baltic Sea, were recently (as of March 2006) discovered to have succumbed to avian flu. According to Doris in Germany, "the so-called Bird Flu....has been spreading. It is now also in Southwestern Germany. On top of that several cats have the disease. Cats are on house arrest in the Twin State of Baden Württemberg now, and most unhappy. Many owners cannot tolerate the frustrated behavior of the upset cats and turn them over to the humane societies, causing more grief for both cats and their owners. I am asking for these poor cats to be included in the meditations." 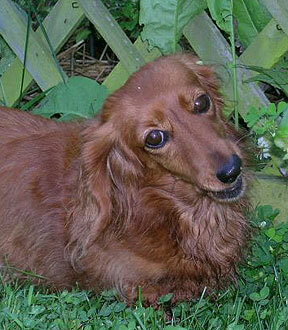 Heidi was a beautiful long-haired dachshund, a kennel dog until she was 18 months. One cold December night as Sananjaleen/June Hughes was retrieving her mother, Gretel, from the kennels, she found Heidi, huddled in a heap, unmoving and with dull blank eyes. Normally wild, shy and untouchable, she carefully carried her back to the tiny cottage where she lived on a beautiful horse farm. Next morning the vet diagnosed a broken lumbar vertebrae - and so, Heidi was allowed to remain with Gretel and Sananjaleen! She recovered completely. “I called her my equal,” Sananjaleen says. “Always I thought of her as pure Spirit. Such joy she brought me in life, such inspiration in her Ascension. And if ever things become seemingly too difficult and complicated in this transformational shift we are all processing, I say: and Heidi did it on dog food! Heidi’s companion in her photo is Tiggy, who came to Sananjaleen after Gretel passed in her sleep, in her own bed. Humpback whales are baleen whales which live in all the world's oceans. They migrate annually from the tropics to the polar regions. They swim in pods of up to twelve during calving periods, or in groups of three to four during migration. They can grow up to 60 feet in length (females are generally larger) and can live to be 95 years old. They are known for their particularly beautiful and complex songs, which are sung by the males, and which can last for up to 20 minutes. The songs change from year to year, but all males sing the same song. Humpbacks are also well-known for breaching (hurling themselves out of the water) and spyhopping (poking their heads up out of the water to look around). Humpbacks are endangered, with an estimated population of between 5,000 and 7,500 worldwide. For more information, visit the Marine Mammal Center or Enchanted Learning. Jamie, a golden retriever/yellow lab mix, came from Best Friends Animal Sanctuary in Kanab, Utah to live with her friends Ann, Steve and Elfie. She was a kind dog and a good friend to everyone, including all people, cats and other dogs. She especially loved children! 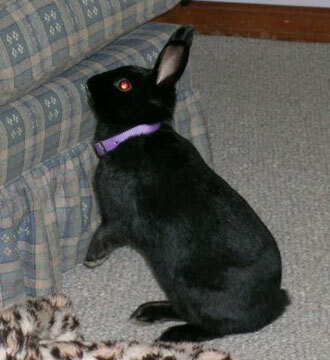 She made her transition over the Rainbow Bridge in January 2008. Jasper lives with his friends Susan, Sheba and Margarita. He is the inspiration behind this website, and has made it clear that he would like to assist in helping animals remember that they can speak. He was a frequent participant in an earth partnership club for children and their families, the Delphi Kids Club (Tucson, Arizona, 2002-2007). Kingsley (or "King") was the newest family member to join Patricia Jepsen and Princess. A husky/golden retriever mix, he bears a striking resemblance in personality and manner to Pat's previous companion, Copper. Since Patricia's transition in September 2009, he makes his home with Princess and their good friend Ann. We look forward to hearing more from him! Golden retriever companion to Patricia Jepsen, Delphi and Copper, Light's special abilities included keen observations of nature and partnership with the angels. She often mentioned the angels in her sharings. 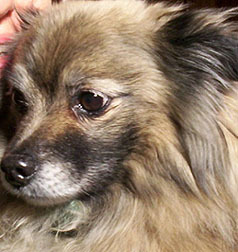 Light made her transition over the Rainbow Bridge in March 2006. Canterbury's Little Lauren (Lilly) - daughter of Lorna, another champion retiree from the show ring. Pure joy, lap dog and adventuress supreme, Lilly came to Sananjaleen/June Hughes at seven years old. She ADORED her mother and was forever torn between sitting on Sananjaleen's lap or hers. Lilly was openly outrageous, and one day (when they were out and about on Therapy Dog 'duty'), she found a glorious big box of chocolates on top of a table, and toppled it onto the floor to share with her beloved mummy. Chocolate is poison for dogs. Lilly is now working with Lorna to help other animals. She was with Sananjaleen and friends for only two very special years. Linus is a Pomeranian mix, born in Albuquerque, New Mexico. Intelligent, funny, smart, and loyal, he does numerous tricks and loves to show off his physical acrobatics with wondrous agility for mere bones. He understands English, although his bilingual nature is non-verbal. He came to Lynn in 1994 and has served for many years in the capacity of the "Best of the Best" and the "Cutest of the Cute," not to mention, "The Faithful One," and is in the angelic order of Dogs.... a superior order of Beings! In fact his nickname is "Angel Dog." He is a much cherished being in this world! Lynn loves to sing to him. Some of their favorite songs include, "There is Nothing Like a Dog," "My Puppy Lies Over The Ocean," "How Much is that Linus in the Window? ", "Liiiiiinus, How I love you, How I love you, My dear old Linus," and many more! When Lynn is not with Linus she works with disabled teenagers at Boulder High in beautiful Boulder, Colorado, or if it's summer you may find her swimming! *Addendum: in Winter 2010, Linus crossed over the Rainbow Bridge after a long life of service and companionship to his friend, Lynn. Canterbury's Little Loreli - miniature long-haired dachshund, champion show and mother dog. Petite, exquisite and drama queen supreme. Loreli came to Sananjaleen/June Hughes at seven years old and life was never the same again. A grand little organizer, she had Sananjaleen trained in no time and practically ran their Animal Communication workshops single-handed. Refusing to sleep on the bed with Sananjaleen, Heidi, Tiggy, Lorna or Candace, she would dive head first into her own little nest, complete with overhead covers. Eventually it dawned on Sananjaleen that this was Loreli's own personal spaceship! Loreli took a dim view of things when Sananjaleen realized her secrets. She loved having secrets. Canterbury's Little Lorna - miniature long-haired dachshund, champion show and mother dog, Lorna came to Sananjaleen/June Hughes at seven years old. From the moment she arrived, Lorna programmed everyone to believe that she was pure Love and goodness, almost to the point of being boring. She was pure Love alright, the rest was pure baloney! Lorna was fun-loving and subtley outrageous! Of major assistance in Animal Communication workshops, she remained in fabulous shape until well past 16 years old and is now working big time with those in disaster areas and in Sananjaleen's meditation groups. Margarita, a great dane mix, lives with her companions Sheba, Jasper and Susan. She loves to play and enjoys going for long walks with other dogs and people. She cares about the welfare of children. Moko, a bottlenose dolphin, has been making her home for the past year near Mahia Beach, off of the east coast of the North Island of New Zealand. She appeared in the nick of time to assist the mother pygmy sperm whale and her calf. Malcolm Smith, the conservation officer, was about to put the whales to sleep, when she appeared and lead them out to sea. Doris writes: "The peahen is tame but living wild. She used to bring her chicks and parade them for me in my kitchen, which caused quite a commotion, as all of them could fly already, and I have a small, narrow kitchen with lots of windows. I was able to direct them out safely and okay, though, and this peahen even perched on my arm like a raptor and let me carry her out, because her wingspan is too wide to fly in this narrow space. This was before her foot got maimed (in an encounter with a dog).... I feel a lot of compassion for her. I call her Princess, or Peahen, or Sweetheart, whichever name comes up for me. The orange cat is one of many belonging to my landlady, and I do not know her name. She comes and goes." According to the April 3, 2006 issue of Time, "Global warming...is the real deal, and human activity has been causing it." At the present time, polar bears are drowning because of lack of sea ice; permafrost (long-frozen areas of land) is thawing out; drought-affected areas have doubled in the last thirty years; many species are becoming extinct or endangered due to rapid climate change; and glacial ice is melting more than twice as fast as predicted, dumping large amounts of fresh water into the ocean and altering ocean currents such as the Gulf Stream, the source of Europe's traditionally mild climate and weather patterns. Now more than ever we are realizing that everyone and everything on Mother Earth is intricately connected. Please make a conscious choice to live your life each day in a way that is harmonious with the Earth and her inhabitants. What benefits the Earth benefits all. Mother Earth will thank you when you do this. The largest predators on land, standing 8-10 feet tall and weighing up to 1500 pounds, polar bears roam the Arctic in winter temperatures of -40 to -50 degrees F. A thick layer of blubber and two layers of fur protect them from the cold; they sometimes dig holes for shelter in snowbanks to escape the biting temperatures and wind. Much has been written lately of the threat to polar bears due to global warming and the shrinking of Arctic ice. Polar Bears International states: "Climate change is the main threat to polar bears today. A diminishing ice pack directly affects polar bears, as sea ice is the platform from which they hunt seals. Although the Arctic has experienced warm periods before, the present shrinking of the Arctic's sea ice is rapid and unprecedented." The polar bear is considered a potentially endangered species; in January 2008 the U.S. Fish and Wildlife Service will be making a final decision about whether to list polar bears as a "Threatened Species" on the Endangered Species list. For more information about Polar Bears, please visit Polar Bears International or Defenders of Wildlife. Prairie dogs live throughout the western United States. They are members of the squirrel family and live underground in large colonies, some hundreds of miles long! They have a sophisticated language comprised of high-pitched barks. They eat mostly plants and some insects, are about a foot high, and hibernate during the winter months. Considered pests by ranchers, their population has greatly decreased over the years due to eradication programs. They are protected, however, in Wind Cave National Park (SD), Devils Tower National Monument (WY) and the Wichita Mountains Wildlife Reserve (OK). Santa Fe, New Mexico also has a city park which hosts a colony of Gunnison's prairie dogs. There are five species of prairie dogs. To learn more about these fascinating creatures, visit www.desertusa.com. Beloved Golden Retriever companion to Patricia Jepsen and a representative for Delphi's programs, Princess was working on a story for children at the time of Patricia's transition in September 2009. She was adopted through the organization Save a Mexican Mutt (SAMM). She now lives with Kingsley and their good friend Ann. Rajah and his brother Baheem live together at the Reid Park Zoo in Tucson, Arizona. They are Indochinese tigers, an endangered sub-species native to Southeast Asia. There are currently only about 1500 of these tigers left in the wild, with another 60 or so in residence in Asian and U.S. zoos. Captive breeding programs and wildlife conservation measures are being pursued, so that the species does not become exctinct. Rajah and Baheem came to Tucson as cubs from the Cincinnati Zoo. Rajah likes to drag a large plastic tube around for fun, and he and Baheem both love to swim in the water. For more information about Indochinese tigers, visit http://www.whozoo.org/anlife2000/andyn/indochinesetiger2.htm or http://www.tigerhomes.org/animal/indo_info.cfm. Thanks also to Bruce, a keeper at the Tucson Zoo, for the information about Rajah and Baheem. Ruby lives in pasture on the lovely 100+ acre ranch called San Cayetano in Tumacacori, Arizona. She is a Hanoverian horse breed and stands at 16'2 or 3. Hanoverian is a warm blood horse which means the breeds of horses from hot and cold climates are blended to produce a "warm blood." The morning Michelle Phillips would meet Ruby, she was told by Sananda that he had a surprise for her. When Michelle spotted Ruby in the last pasture, Ruby spotted her and instantly their souls were ONE. Then Sananda said, "It is our Ruby!" Michelle Phillips shares Ruby with Sananda as partners. The saguaro cactus is native to the Sonoran Desert in Arizona and California, USA and Mexico. Saguaros can grow as high as 50 feet, weigh several tons, and can live to be 200 years old. They do not begin to grow arms until they are 75 years old. Their accordian-style bodies allow them to store water, expanding in the rainy seasons and contracting during the drier months. They provide homes to many desert creatures, especially birds such as the Elf Owl, Cactus Wren, Gilded Flicker, Harris Hawk, and Gila Woodpecker, which pecks holes in the body to make nests. Once in a while you may even see a bobcat sitting on top! The saguaro is sacred to the Tohono O'odham, the native people of the desert, who believe that they house the spirits of their ancestors. Sheba lives with her companions Susan, Margarita and Jasper. A feral kitten, she was found under a cactus in Tucson, Arizona by Margarita. Susan wanted to name her "Star," "Celeste," "Felicity" or "Hope", but then the name "SHEBA" came roaring through, with the awareness that this kitten actually saw herself as a lioness. She has the capacity to act as a spiritual guard. Canterbury's Little Leslie (Tiggy) - miniature long-haired dachshund and mother of many, Tiggy came to Sananjaleen/June Hughes at seven years old. She became the Wise One in their Animal Communication workshops, and once informed a visiting Pomeranian that she (the Pomeranian) was a Medicine Dog! The other dogs looked to her as their leader, wrapping themselves around her in the little cuddler beds. Once, during a meditation, Sananjaleen experienced herself as a young Sheik on a vision quest in the desert, alone with her Hawk, her Cheetah and her Afghan. Her friends all looked at Tiggy and said, "there's your Afghan." Indeed, Tiggy ran so fast, Sananjaleen used to call her "She Who Raced The Wind!" Tiggy works with Loreli and others for the Earth and all animals. After nearly six years in Spirit, she says she has just been promoted and is now "in charge of ALL the Dragonflies!" White-tailed Deer live in wooded areas throughout southern Canada, the United States (excluding the Southwest, Alaska and Hawaii) and Central America. They are close relatives of the Mule Deer native to the desert southwest. White-tailed Deer have white around the nose and eyes, on the throat, stomach, and underside of the tail. When the deer is startled or scared, it raises it tail and waves it from side to side like a flag. The white tail also provides a visual for youngsters when the mother is running. They follow the tail! White-tailed Deer can run up to 40 miles an hour and are good swimmers. The males grow and shed their antlers yearly. To learn more about White-tailed Deer, visit http://www.nhptv.org/natureworks/whitetaileddeer.htm and http://www.desertusa.com/mag99/june/papr/wtdeer.html.